Oct 02, 2017 (LBO) – Sri Lanka’s Foreign Minister has participated in a discussion with Vice President of the European Investment Bank (EIB) to evaluate the possibility of entering into a financing agreement for several major infrastructure development projects for Megapolis Ministry. Foreign Ministry said in a statement that Foreign Minister Tilak Marapana met with the Vice President of EIB, Andrew McDowell with other senior officials at the bank’s headquarters during an official visit to Luxembourg on 27th September 2017. This was the first visit of a Sri Lankan Foreign Minister to Luxembourg since the establishment of diplomatic relations between the two countries in 1972 even though Luxembourg is among the top 15 foreign direct investors in Sri Lanka. 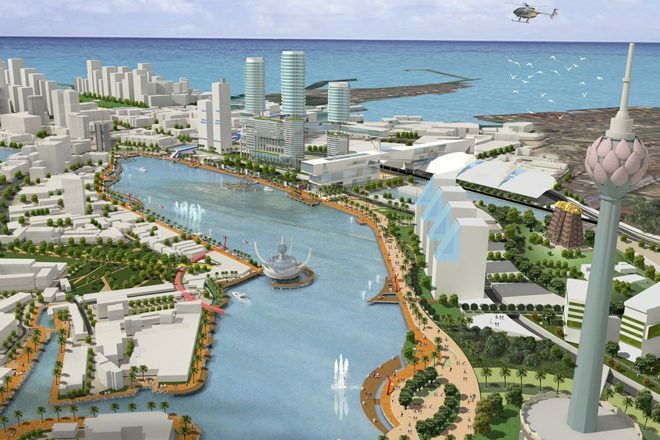 The prime objective of the Western region megapolis Development is to bring systematic changes and development processes into the urban community in Sri Lanka. It will also ensure that the inhabitants of urban areas become a part of socio economic development of the country while maintaining high levels in quality of life. A high-level delegation from the European Investment Bank, the world’s largest international public bank, made an official visit to Sri Lanka in March this year to explore opportunities for investment. Earlier this year, the European Investment Bank also agreed to provide 50 million euros to support improvement and expansion of sewage networks across the Sri Lankan capital Colombo. The European Investment Bank expects to provide more than 1 billion euros each year to support new investment across Asia. Last year the European Investment Bank Group provided 84 billion euros to finance new investment around the world, including 19.6 billion euros for climate related investment. Foreign Ministry said Minister Marapana had a breakfast meeting with his Luxembourg counterpart Jean Asselborn at the Ministry in Luxembourg City. The two Ministers have agreed to further strengthen bilateral relations with particular focus on economic opportunities and undertook to facilitate the upcoming visit of a business delegation from Sri Lanka to Luxembourg in this regard. Luxembourg as one of the world’s top financial centres has interest in capital investments and there are several of the world’s leading multinational companies that have their headquarters based in Luxembourg.